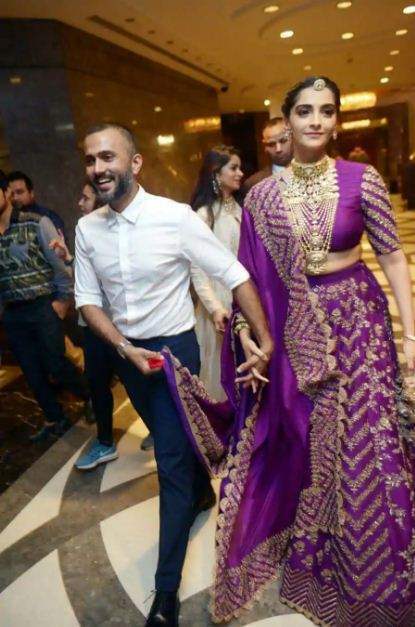 When we list the cutest couples of B-town, Sonam Kapoor Ahuja takes the cake with hubby Anand Ahuja. Ever since the world got a whiff of their secret romance, the two have managed to get everyone hooked to their adorable pictures and online PDA. Their big fat Indian wedding in May stole hearts collectively due to sheer love and adoration between SonAnd and their beautiful wedding pictures. It has been more than four months of marital bliss for the Ahuja couple but they still give us major newly-married-couple vibes. Sonam and Anand have a completely different line of work. While the former is a leading actress of Bollywood, the latter is an entrepreneur. What connects them is Fashion. Anand has a line of clothing and sneakers called Bhane and VegNonVeg respectively. And Sonam is the ultimate style icon and a fashion enthusiast. Sonam was in Delhi last weekend. The actress walked the ramp for a leading jewellery brand. She was looking like a true Indian beauty in a traditional bridal avatar. 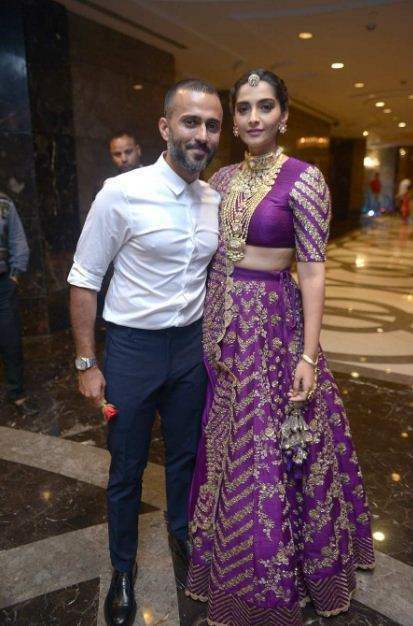 She wore a purple lehenga which was heavily embroidered in gold. An elaborate necklace adorned her torso. She looked nothing less than a regal queen in the desi avatar. But she wasn’t alone at the event. Hubby Anand was there to support and cheer her as she walked the ramp. The two made a good-looking pair as they posed for the paparazzi. Anand was dressed sharply in smart formals. He paired a pair of navy blue trousers with a crisp white shirt and was making a good picture along with his missus. 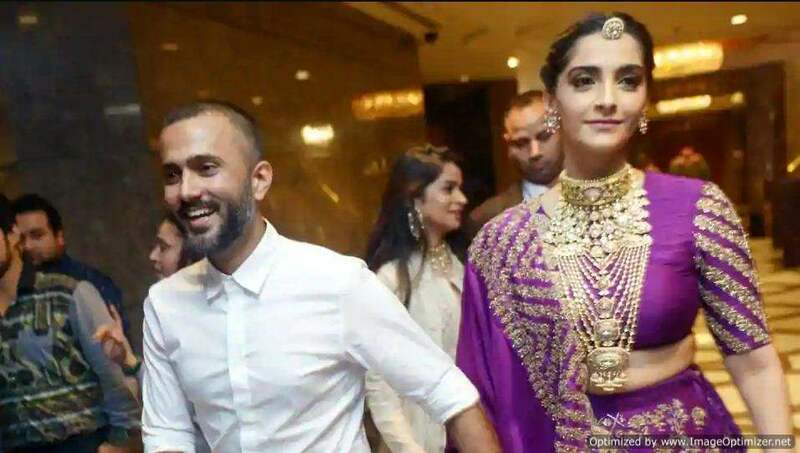 What caught our attention was how Anand was holding Sonam dupatta when they walked in at the venue. He even refused to let go of it which made Sonam blush like a schoolgirl. Aren’t they just the cutest? 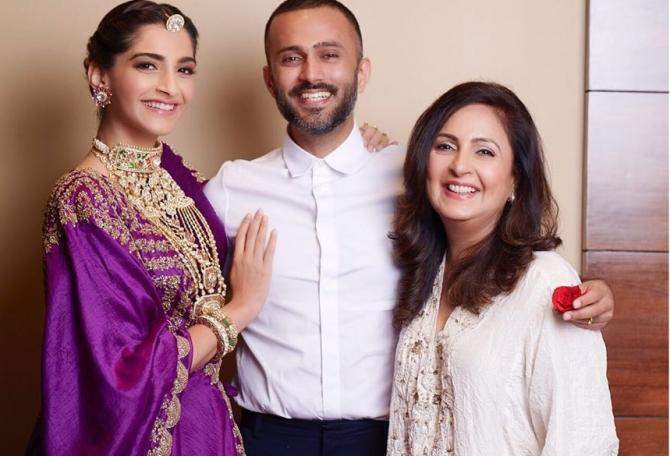 On the work front, Sonam has completed the shooting for ‘Ek Ladki Ko Dekha Toh Aisa Laga’ which stars her father Anil Kapoor as her on-screen dad, along with Juhi Chawla and Rajkummar Rao. Sonam has recently started shooting for ‘Zoya Factor’ which is based on the novel by Anuja Chauhan by the same name. It stars Dulquer Salmaan opposite Sonam.